Need dinner ready in a flash? This Quick Sausage Pasta is for you! If I want to make something that I KNOW my kids will eat, as long as I add pasta and/or sausage to it, I know it will be a winner! 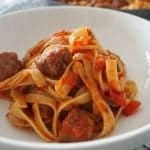 This quick Sausage Pasta is always popular with my boys and I love that it can easily be scaled up or down depending on how many people, or how many meals I want to get out of it. What also makes this Sausage Pasta a great quick family dinner is that you can also sneak some veggies into the kids too. In this version I added a big zucchini (grated) but I’ve also made this with a combination of grated carrot, sweet potato and zucchini too. Are you looking for an easy family dinner? This Quick Sausage Pasta is for you! You can up the vegetable content by adding grated carrot or sweet potato and you will have this dinner ready to eat within 30 minutes. If you have any leftovers, they can be kept in the freezer for up to two months. Cook the pasta as per the packet instructions. In the meantime, add the olive oil to the frying pan and heat over a medium. Cut the ends of the sausages and squeeze out the meat (directly into the frying pan)to form little meatballs. Add the grated onion and crushed garlic and cook for 3 minutes or until the onion begins to turn translucent. Add the grated zucchini and cook for a further 3 minutes - tossing the sausage 'meatballs' regularly to ensure they are brown on each side. Reduce the heat slightly and add the crushed tomatoes, mixed herbs and salt and pepper before cooking for a further 3 - 4 minutes or until the sausage meatballs are cooked through. Use a pair of tongs to carefully transfer the cooked pasta directly into the frying pan and gently toss it through the tomato and sausage mixture to coat. Divide between four bowls and serve with a little grated parmesan cheese. You can also add extra grated vegetables to this recipe.